Ireland under George II, 1727-1760. The young head coinage of 1736-1755, with large lettering and a Roman V in GEORGIVS, 1747-1753. A 1753 Halfpenny, S.6607, 8.86 g., coin orientation, plain edge. Obv. Laureate bust of George II l., around GEORGIVS . II . R E X . Short 2nd top leaf. The top ribbon points to the rt. side of the lt. foot of the X. The bottom ribbon points to the stop. There is a faint vertical die crack, easy to miss, but definitely a crack, and not a scratch, from the middle of the top leaf extending down, to the leaf below, and thru the hair, and out to the face, at a line drawn from the level of the bottom of the nose, and continuing just behind the Adam's apple, down the throat to the truncation of the bust. A scarce die, likely to the die destructing early. Rev. crowned harp of 9 strings divides the date 17 53 at the bottom, H I B E R N I A around at top. No central pellet on any string. The rt side of the B aligns w the lt. side of the crown. The top of the cross on the crown, just to the rt. of the middle of a line joining the bottoms of the E and R. A diagnostic die break from the rt. side of the B to the lt. side of the beaded crown. This coin is the Millenium Coin, catalogued by the late Patrick Finn, for Whytes, in 2000. At first, I thought it not, but superior to the Millenium coin, due to the photography. But examining the large color photo on page 43 of the finely struck featured 1753 halfpenny of the Millenium Sale, Lot 371, the diagnostic vertical die break is visible, bet the upper and immediately lower leaves at the top of the head, as is the ever so lightly toned area in the field, before the forehead. The rev. photo, on page 62, shows the diagnostic distinctive toning of the B in LIBERTY, and the die break from the B to the crown. Thus, the pedigree is extended, to the Spink Numismatic Circular, May 1970, No. 6091. At the time of the Millenium Sale, I, unlike Patrick Finn, did not understand the rarity of this piece in uncirculated condition w color. 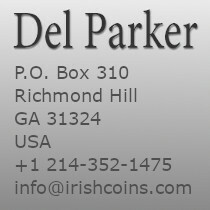 Irish coppers are available w color, and various shades of red, for the dates 1737, 1738, 1744 (farthings only), 1760, 1769, 1775, 1776, 1781, 1782, 1805, 1806, 1822, and 1823. All other dates, from 1680 thru 1823, are just not available, w full color, and have not appeared at auction for some 50 years. They are that scarce. Needless, it was a thrill to discover, after the recent DNW sale, this purchase, is the missing Millenium piece. That means it's the only 1753 halfpenny this nice, and there are not two of them. Patrick Finn was oh so right to feature this coin w a full page color photo, as it is the only full color Irish copper of the scarce dates, offered the last 50 years. It is finer than any 1753, in any collection known to me.